North Korea leader Kim Jong-un gleefully applauded as he watched a display of the country’s military might during the secretive state’s Day of the Sun – and his regime warned of an ‘annihilating strike’ if the US attacks. Kim, wearing a Western-style suit at Kim Il-sung Square, saluted formations of soldiers who yelled out ‘long live’ to celebrate the 105th anniversary of his grandfather’s birth. The dictator has accused President Donald Trump of provoking his nation towards armed conflict with a series of increasingly aggressive moves, including sending the USS Carl Vinson to the Korean peninsula. US officials feared Kim Jong-un would mark the national holiday by launching North Korea’s sixth nuclear weapons test, since the country has used previous holidays to showcase its military prowess. 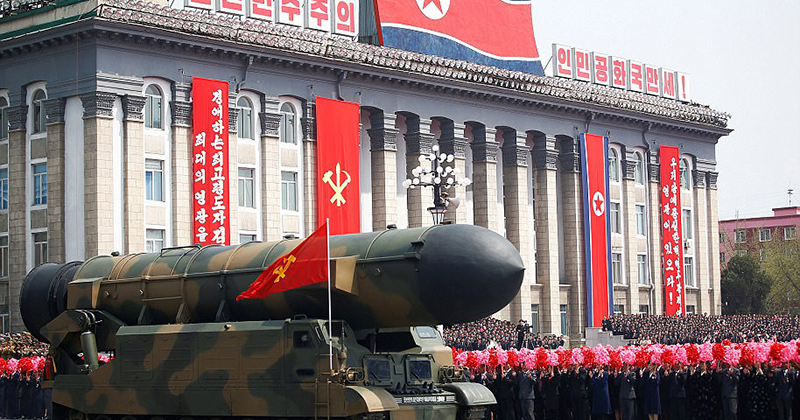 The despot, who did not speak during the annual parade, flaunted prototypes of intercontinental ballistic missiles (ICBM), which experts fear could one day be capable of striking mainland America. One of Kim’s top officials, Choe Ryong Hae, today vowed North Korea would ‘beat down enemies with the power of nuclear justice’. Submarine-launched ballistic missiles (SLBM) were also among the sophisticated military hardware on show for the first time, indicating an improving technological capability that could help it evade anti-missile systems.